Cake Smashes are a really fun way to celebrate your little ones milestone birthdays! Cute baby that can sit up gets to smash up and eat a cake, and have great fun making loads of mess and I document all of the carnage. Everyone enjoys the experience because normally parents are hesitant to allow their kids to make a giant mess and eat a ton of cake. Once you are in my studio there is no need to worry about mess! Go wild! What will happen during our Cake Smash Session? Before we bring the cake into the picture we will take some photos of your little one looking beautifully clean in outfit number one, they can show off their crawling, cruising, walking, clapping, or favourite toys of the moment. I have music, puppets, toys, props and lots of tricks up my sleeve to capture those natural smiles. Then we change to outfit number 2, the cake smash costume! The child will be gently encouraged by myself and anyone else attending to explore and eat the cake. Some Children go wild and others need more reassuring. Kids are all different and unpredictable so however they are feeling on the day is absolutely fine. When the child is done with the cake we will quickly clean up and if you would like we can do a little extra ‘SPLASH session’, where they wash off the cake with a warm bubble bath in one of my mini tubs. We can use a bubble machine too to blow bubbles overhead and make them giggle! This is always a great finish to the session. Your photos will be edited after the session and uploaded to a password protected website gallery for you to view and make your selection. If your little one isn’t into cake or has allergies then we can try many other fun shoot ideas. I have done fruit platter 1st Birthday shoots for fruit lovers and ones that are not used to too much sugar, messy Spaghetti, donuts, edible Painting sessions … the sky’s the limit! Personalising your cake smash is great fun! Parents often enjoy buying props and outfits to make their cake smash really suited to their child. May their favourite TV show, Nursery theme, 1st Birthday party theme or just colour theme with matching bunting, icing, clothes and balloons. Other great ideas to celebrate older children’s birthday milestones are Glitter shoots, Mini make overs, Fancy Dress shoots, paint splashes, whatever your kid’s are into just let me know, I would love to create a unique photo shoot to remember this special birthday. For the grown ups that still love cake and photos how about an ADULT CAKE SMASH!? Treat yourself to a Make over, Prosecco & cupcakes, or bring a few friends along for a giggle. 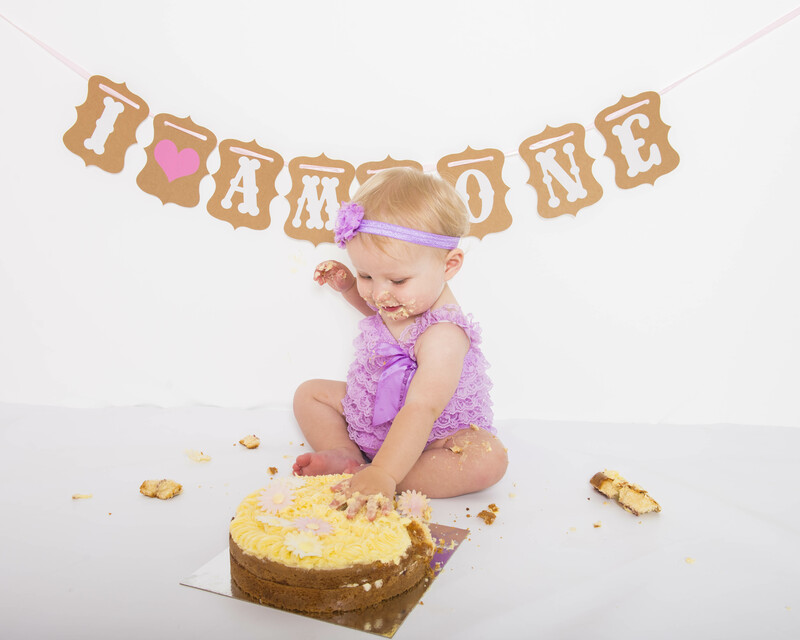 Cake smash outfit – Most parents like to see 1 year olds bare chested and legged to show off cute chubby fat rolls and let baby get extra messy. Tutus, Frilly nappy covers, hat, hair bands, bow tie or braces look great. Accessories to match your theme – Balloons, bunting etc. Parents please feel at ease that I am very used to easing shy children into a shoot (they usually leave as my new best friend) and I have witnessed almost every kind of toddler tantrum imaginable. So please don’t worry. I am very patient. If you would like to chat over your special Birthday photo shoot ideas please get in touch. Previous Capturing the passing of time…and Oxfordshire bluebells! Next Baby Sinead’s Birth Story – When things don’t go to plan!